<me> I praise You lord, for your power and your might. Your mighty Keys and Spirit Helpers defending us!! I trust in You for ever and ever, knowing that besides You I have no help. In the midst of the Enemy’s camp I do dwell most of the time, and my soul chews on bitterness, but in You I have solace and comfort. I will always praise You, Lord, for you have set me free. I don’t worry about anything anymore, just let me have my place with You, fully encapsulated in Your love dear Jesus. <Jesus> Unto you is given the kingdom, through the Keys. We are always on missions everywhere on Earth, because the Enemy’s principal strongholds are being cast down. One by one, his bases are being ‘belong to us!’ and one by one we are taking over more of his territory. . . . The battle is not for companies or governments or control of land, but for souls. That is Earth’s main resource. We gotta save em’! I did the work, now you just connect the need to the answer. Bring with you My Salvation, trumpeting everywhere! Know that you are under heavy fire because the Enemy is very afraid of Me coming. He knows that once you pull out those keys, his doom is sealed. Every knee shall bow at the power of the keys, and those chosen ones who wield this power shall conquer the world for My glory. 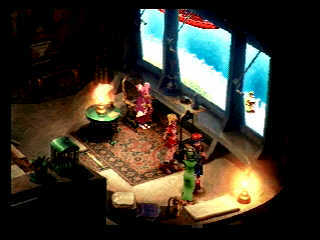 I am playing “Chrono Cross and see a glimpse into what Heaven’s culture should be like: You can walk into anybody’s house, anywhere, and they aren’t even surprised. They just tell you something immediately about whatever is going on in the town and almost don’t even think it’s weird that a random person just came in their house!! This is almost the age old joke now about rpg’s, but I think it’s really what Heaven is like in some ways. People with all their quirks, still, but yet they have love and have adapted to this new culture where privacy isn’t this fake thing where you shut people outin yoru day to day life yet are aware of and comfortable with the fact that the govt. is spying on your every move and recording you all day and looking at everything you say and type and where you go . . . in otherwords it’s a reverse, to where there is little government but more interaction with the people around you. God isn’t ‘spying’ on you all the time and checking to see whether your’e being good or not. In fact “good” is defined in yoru allegiance to Jesus and you can’t even get into Heaven if you don’t believe in Jesus. After that you can go wild! But privacy in the sense of ignoring people around you and being completely selfish is nonexistent. It’s expected that you’d interact with anyone who comes across your path, in fact this is necessary for a healthy existence. Who wants to live in their own private hell with no one lese involved in their lives? So this I thought was cool . . . and I’d like to explore this a bit more with Annette and her heavenly adventures. Then it’s like there are endless possibilities with where you can go and who you can talk with, and what you can find out. It’s not like you have to find your way through a linear path and just do certain things and talk to certain people, like we usually do in our lives and our habits on Earth. We can leave a lot more room for the Holy Spirit to work. <Jesus> Amen! In fact, Heavenly Culture is not solidified yet. I am still figuring out exactly what it is. It’s Love, but Love is so big and pervasive, it’s not like you can just define it. Love is God! And Freedom exists in Love. That’s why I don’t always look over the shoulder of everyone in the Family or in Heavenly Cultural societies. You are free to figure things out on your own to some extent, but how much better it is to include Me and to allow me to figure things out alongside you. That way you are never alone. But Heavenly Culture is indeed people working together, being involved in each other’s lives not because they have to be, but because they love each other, and they love Me most of all. This really is what it’s all about, no joke! So get busy, getting into Her! .>>. Do it!! Go there, and tie yourself to Heaven. She is waiting. I am there, too, for it is My Father’s House. Heaven is so big and expanisve, and not just a giant pyramid with a bunch of cities and landscapes and wonders in Her. There is more. You just go and find out, see? I love you!